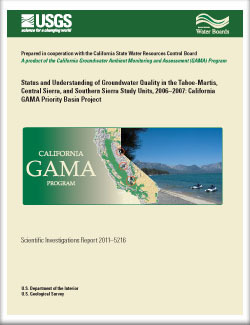 Groundwater quality in the Tahoe-Martis, Central Sierra, and Southern Sierra study units was investigated as part of the Priority Basin Project of the California Groundwater Ambient Monitoring and Assessment (GAMA) Program. The three study units are located in the Sierra Nevada region of California in parts of Nevada, Placer, El Dorado, Madera, Tulare, and Kern Counties. The GAMA Priority Basin Project is being conducted by the California State Water Resources Control Board, in collaboration with the U.S. Geological Survey (USGS) and the Lawrence Livermore National Laboratory. The project was designed to provide statistically robust assessments of untreated groundwater quality within the primary aquifer systems used for drinking water. The primary aquifer systems (hereinafter, primary aquifers) for each study unit are defined by the depth of the screened or open intervals of the wells listed in the California Department of Public Health (CDPH) database of wells used for municipal and community drinking-water supply. The quality of groundwater in shallower or deeper water-bearing zones may differ from that in the primary aquifers; shallower groundwater may be more vulnerable to contamination from the surface. The assessments for the Tahoe-Martis, Central Sierra, and Southern Sierra study units were based on water-quality and ancillary data collected by the USGS from 132 wells in the three study units during 2006 and 2007 and water-quality data reported in the CDPH database. Two types of assessments were made: (1) status, assessment of the current quality of the groundwater resource, and (2) understanding, identification of the natural and human factors affecting groundwater quality. The assessments characterize untreated groundwater quality, not the quality of treated drinking water delivered to consumers by water purveyors. Relative-concentrations (sample concentrations divided by benchmark concentrations) were used for evaluating groundwater quality for those constituents that have Federal or California regulatory or non-regulatory benchmarks for drinking-water quality. A relative-concentration (RC) greater than (>) 1.0 indicates a concentration above a benchmark. RCs for organic constituents (volatile organic compounds and pesticides) and special-interest constituents were classified as “high” (RC > 1.0), “moderate” (1.0 ≥ RC > 0.1), or “low” (RC ≤ 0.1). For inorganic constituents (major ions, trace elements, nutrients, and radioactive constituents), the boundary between low and moderate RCs was set at 0.5. A new metric, aquifer-scale proportion, was used in the status assessment as the primary metric for evaluating regional-scale groundwater quality. High aquifer-scale proportion is defined as the percentage of the area of the primary aquifers with RC > 1.0 for a particular constituent or class of constituents; moderate and low aquifer-scale proportions are defined as the percentages of the area of the primary aquifer with moderate and low RCs, respectively. Percentages are based on an areal rather than a volumetric basis. Two statistical approaches—grid-based, which used one value per grid cell, and spatially weighted, which used multiple values per grid cell—were used to calculate aquifer‑scale proportions for individual constituents and classes of constituents. The spatially weighted estimates of high aquifer-scale proportions were within the 90-percent (%) confidence intervals of the grid-based estimates in all cases. The status assessment showed that inorganic constituents had greater high and moderate aquifer-scale proportions than did organic constituents in all three study units. In the Tahoe-Martis study unit, RCs for inorganic constituents with health-based benchmarks (primarily arsenic) were high in 20% of the primary aquifer, moderate in 13%, and low in 67%. In the Central Sierra study unit, aquifer‑scale proportions for inorganic constituents with health-based benchmarks (primarily arsenic, uranium, fluoride, and molybdenum) were 41% high, 36% moderate, and 23% low. In the Southern Sierra study unit, 32, 34, and 34% of the primary aquifer had high, moderate, and low RCs of inorganic constituents with health-based benchmarks (primarily arsenic, uranium, fluoride, boron, and nitrate). The high aquifer-scale proportions for inorganic constituents with non-health-based benchmarks were 14, 34, and 24% for the Tahoe-Martis, Central Sierra, and Southern Sierra study units, respectively, and the primary constituent was manganese for all three study units. Organic constituents with health-based benchmarks were not present at high RCs in the primary aquifers of the Central Sierra and Southern Sierra study units, and were present at high RCs in only 1% of the Tahoe-Martis study unit. Moderate aquifer-scale proportions for organic constituents were < 5% in all three study units. Of the 173 organic constituents analyzed, 22 were detected, and of those 22, 17 have health-based benchmarks. Organic constituents were detected in 20, 27, and 40% of the primary aquifers in the Tahoe-Martis, Central Sierra, and Southern Sierra study units, respectively. Four organic constituents had study-unit detection frequencies of > 10%: the trihalomethane chloroform in the Tahoe-Martis study unit; chloroform and the herbicide simazine in the Central Sierra study unit; and chloroform, simazine, the herbicide atrazine, and the solvent perchloroethene in the Southern Sierra study unit. The second component of this study, the understanding assessment, identified the natural and human factors that may have affected groundwater quality in the three study units by evaluating statistical correlations between water-quality constituents and potential explanatory factors. The potential explanatory factors evaluated were land use, septic tank density, climate, relative position in the regional flow system, aquifer lithology, geographic location, well depth and depth to the top of the screened or open interval in the well, groundwater age distribution, pH, and dissolved oxygen concentration. Results of the statistical evaluations were used to explain the occurrence and distribution of constituents in the study units. Aquifer lithology (granitic, metamorphic, sedimentary, or volcanic rocks), groundwater age distribution [modern (recharged since 1952), pre-modern (recharged before 1952), or mixed (containing both modern and pre-modern recharge)], geographic location, pH, and dissolved oxygen were the most significant factors explaining the occurrence patterns of most inorganic constituents. High and moderate RCs of arsenic were associated with pre-modern and mixed-age groundwater and two distinct sets of geochemical conditions: (1) oxic, high-pH conditions, particularly in volcanic rocks, and (2) low-oxygen to anoxic conditions and low- to neutral-pH conditions, particularly in granitic rocks. In granitic and metamorphic rocks, high and moderate RCs of uranium were associated with pre-modern and mixed-age groundwater, low-oxygen to anoxic conditions, and location within parts of the Central Sierra and Southern Sierra study units known to have rocks with anomalously high uranium content compared to other parts of the Sierra Nevada. High and moderate RCs of uranium in sedimentary rocks were associated with pre-modern-age groundwater, oxic and high-pH conditions, and location in the Tahoe Valley South subbasin within the Tahoe‑Martis study unit. Land use within 500 meters of the well and groundwater age were the most significant factors explaining occurrence patterns of organic constituents. Herbicide detections were most strongly associated with modern- and mixed‑age groundwater from wells with agricultural land use. Trihalomethane detections were most strongly associated with modern- and mixed-age groundwater from wells with > 10% urban land use and (or) septic tank density > 7 tanks per square kilometer. Solvent detections were not significantly related to groundwater age. Eighty-three percent of the wells with modern- or mixed-age groundwater, and 86% of wells with detections of herbicides and (or) THMs had depths to the top of the screened or open interval of < 170 feet. These observations suggest that modern groundwater has infiltrated to depths of approximately 170 feet below land surface. Land use and occurrence of herbicides and solvents were the most significant factors explaining the occurrence of nitrate. Wells with > 5% agricultural land use and detection of a herbicide or solvent had the highest nitrate concentrations. Comparison between observed and predicted detection frequencies of perchlorate suggests that the perchlorate detected at concentrations < 1 microgram per liter likely reflects the distribution of perchlorate under natural conditions, and that the perchlorate detected at higher concentrations may reflect redistribution of originally natural perchlorate salts by irrigation in the agricultural areas of the Southern Sierra study unit. Fram, M.S., and Belitz, Kenneth, 2012, Status and Understanding of Groundwater Quality in the Tahoe-Martis, Central Sierra, and Southern Sierra Study Units, 2006–2007—California GAMA Priority Basin Project: U.S. Geological Survey Scientific Investigations Report 2011-5216, 222 p.